This week we’re headed to the Game Developer Conference in San Francisco—it’s a great opportunity to get inspired, engage with new technology and learn from each other. 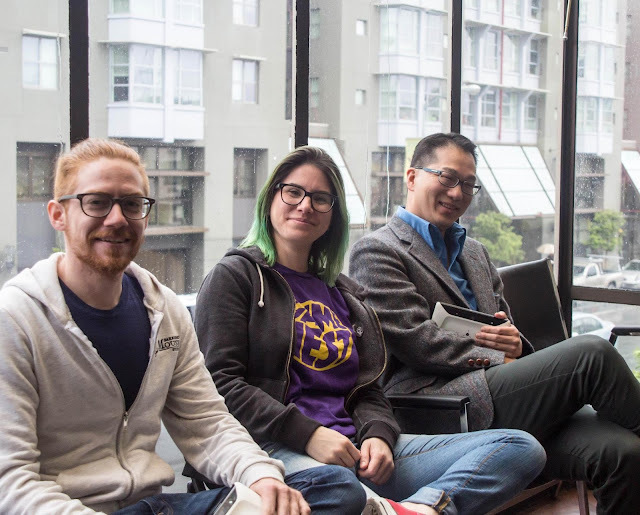 In the meantime, enjoy an in-depth interview with game developers Danielle Swank and Jim Fleming of Barking Mouse Studio, and Josh Lee of Floor is Lava. The three recently met up at Gamenest, and created a brand new Project Tango game, World of Orbles. Danielle: The World of Orbles is a real-time strategy game that deals with fictional creatures called Orbles. Orbles are very smart and can build really amazing things, like trans-dimensional portals, but they also have a tendency to get distracted and forget to double check their math. So when their trans-dimensional portal malfunctions and leaves them stranded, it’s no surprise to anyone. Chaos ensues as you try to get the Orbles back to their home dimension. By using Project Tango AR features, you can see the Orbles right in your physical environment. What got you excited about developing for Project Tango? Jim: Mixed reality is really compelling. Literally placing something you’ve created into the real world and being able to walk around it feels like the future. Josh: A lot of my work involves playing in physical spaces, and Project Tango's ability to map a real room and blend digital objects with it opens up all kinds of new possibilities for gameplay. How do you think Project Tango enhances your user’s experience? Josh: Giving users the ability to engage with digital games the way they would with a physical space is extremely powerful. Interacting with digital objects in a more physical way – looking at them from different angles, tracking their movement, etc. – makes it possible for users to play games much more intuitively, with less fiddling around with camera controls and such. What is your favorite Project Tango feature? Jim: Real-time mesh generation and out-of-the-box Unity integration. Josh: Building a digital model of a physical room in real time is pretty hard to beat. What was your biggest hurdle getting starting with Project Tango? Danielle: Having to write our own pathfinding was an unexpected hurdle. We normally rely on Unity and static environments to provide character and npc movements. Since it’s dynamic, you can’t use Project Tango’s area mesh generation with the Unity pathfinding. Instead we had to rely on ray casting against the depth map that the Tango generates and use a modified boids algorithm to control our npcs. 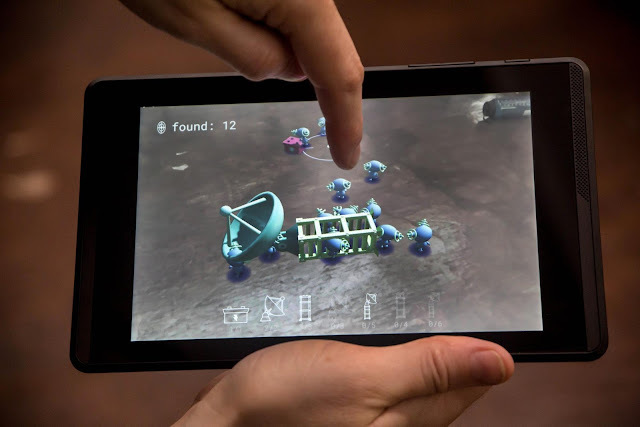 What creative solution did you come up when using Project Tango for your app? Danielle: We had to come up with a creative solution to what happens with our characters if they move behind a real-world object so we decided to write a glitch shader. It transitions the character from visible to hidden in a believable manner since we can’t partially occlude game objects. Danielle: The Project Tango developer docs and just reading the Unity integration. There a lot of good information in the source code. Also having Unity experience was really helpful. Danielle: Getting the game characters to look like they are part of the environment was tough. It’s definitely harder to make an AR game then a normal game, so be sure to give yourself enough time. That all said, I think there are all sorts of possibilities for AR that you can’t do with a normal game. Jim: You’ll have to get creative when working with AR. Some things you would do in a normal game don’t make sense in AR. What are you most excited to see with a the launch of Lenovo’s phone with Project Tango? Danielle: I’m excited to see the devices in a lot of people’s hands. I think it’s really awesome that I can build a world that’s different than everyday reality and share it with people around the globe. Jim: The smaller phone form factor opens up more use cases such as Cardboard. Josh: I want to go to an AR gaming party, where all the partiers bring their Tango-enabled devices to a special location and play crazy games together.